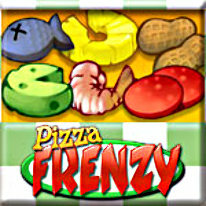 Pizza Frenzy is a wacky action puzzler that puts you in charge of your own pizza delivery empire! Reflexes and quick thinking are required to juggle all the orders. This fast-paced game will keep your mouse clicking with rewarding action and pattern matching. Take advantage of your bird's eye view of the city to keep a lookout for hungry customers. Match incoming orders with your pizza kitchens to deliver your pies fresh and on time. Work fast to avoid missing orders! If you miss too many, your customer satisfaction will plummet. If it gets too low, Game Over!